Marianne is a national symbol of the Republic of France. She is the personification of liberty and reason, and she is often portrayed as the Goddess of Liberty. 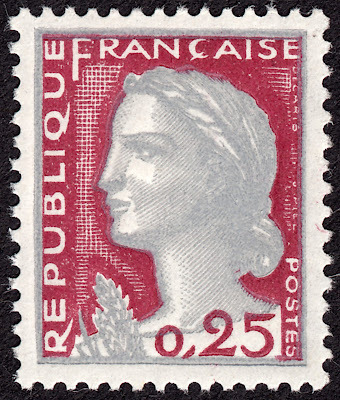 From the mid 1940's the face of Marianne began adorning postage stamps on a regular basis. Several distinguished stamp designers have applied their talents to creating their own unique versions of the iconic Marianne stamp design. Names like Dulac, Fernez, Muller, Bequet, and of course the stunning classic design by Gandon. In 1960 Albert Decaris was given his turn. Unfortunately the chosen development of this stamp did not produce the best results. One wonders what the stamp would have looked like if Decaris had also engraved his design and if it were printed in Recess instead of Typography. But alas this was not the case. On 17 June 1960 France issued the Marianne de Decaris stamp. The stamp was designed by Albert Decaris and engraved by Jules Piel. The issue was printed in Typography. The design of this stamp was potentially really nice, but the method of printing, in my opinion, let the composition down somewhat. Having said that, it is still an appealing design and it is quite collectible, especially considering the numerous booklets available. But there is another major appeal to this design - for me, at least. It has two main variations or "Types". A bit of net searching revealed there are also many minor variations to look out for. For now, let's just focus on the two main types. How do we distinguish one from the other? Well, it's actually fairly simple, and if you have descent eyes, it can be done without any aids. Otherwise, a magnifying glass will be more than adequate. I have created a diagram - see below - to help us along. 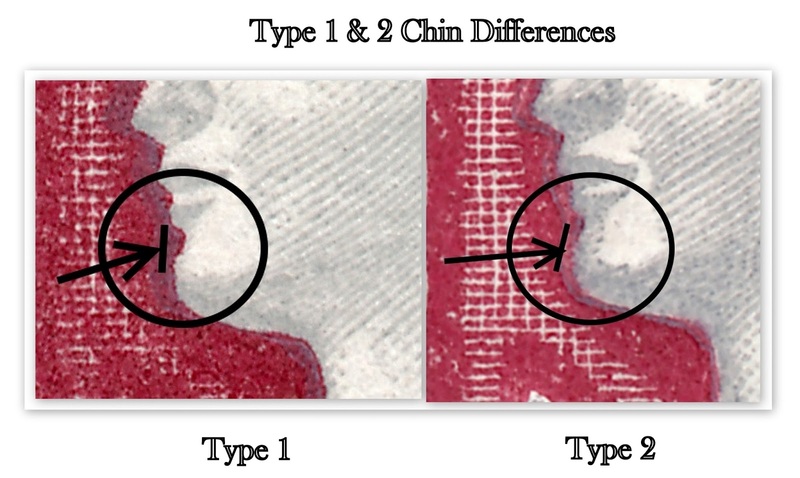 Looking at the diagram you can see immediately the different shading between the chin and the lower lip. It is important to note at this point that I found some discrepancies between websites as to which variation is Type 1 and which is Type 2. One site I consulted had the types listed the opposite way around to what I have shown above. But I found two other reference sites that list them this way. So I have gone with the odds. If anyone has further information I'd love to hear from you - and if need be alter my diagram. There is also another difference between Types 1 and 2, but I haven't been able to work it out clearly yet. All I know is that Type 2 has "trimmed vertical sides". Whether this refers to perforations or the stamp frame, I don't know. Again, if anyone can clear this up it would be great.